We had never hiked or visited the area. April 5-11 was proclaimed by the Governor as State Natural Areas Week, so we tried to find an area we had never visited to hike. 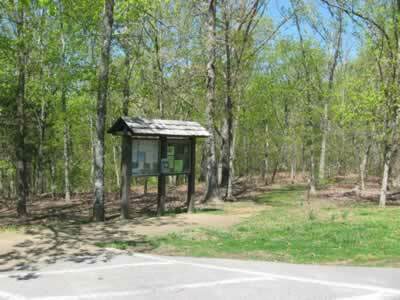 Devil’s Backbone was supposed to be a good hike and it is always fun to travel on the Natchez Trace. 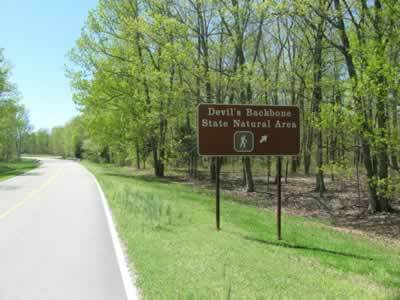 Directions: Devil’s Backbone is located on the Natchez Trace at mile 394. As a reference, the junction with Highway 100 southwest of Nashville is at mile 444. The National Park Service map is helpful. A large sign directs traffic to the trailhead. From the trailhead kiosk, take the well defined trail as it curves along below the road. After .10 miles the trail will descend a steeper section and intersect with an old road. The road follows a ridge. 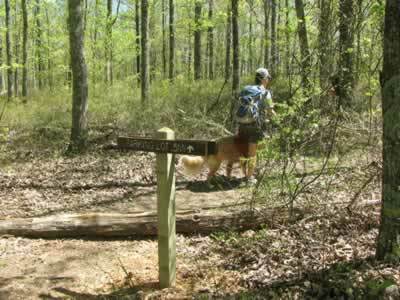 At .50 miles the trail junctions with the "Loop Trail 2mi" sign. 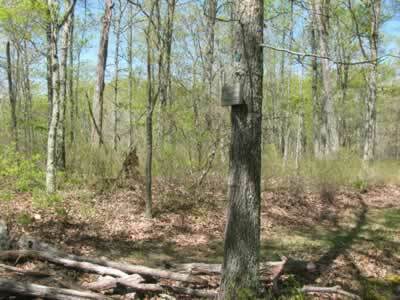 The description follows the trail going counter-clockwise or actually just going straight at the sign. The trail continues along the ridge for .30 miles before it begins the descent. 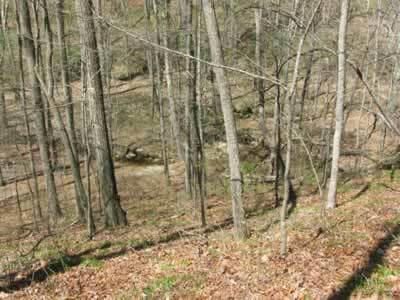 After one switchback the trail makes its way to the bottom of the hollow and follows along a branch of the creek. After a short while the trail crosses the creek. There is no bridge at this point. There were a few limb branches spanning the water, but with a little water running it is a wet crossing. Also of note there are no blazes within sight of the crossing. A secondary path continued along the creek, where it was presumably looking for a drier crossing. 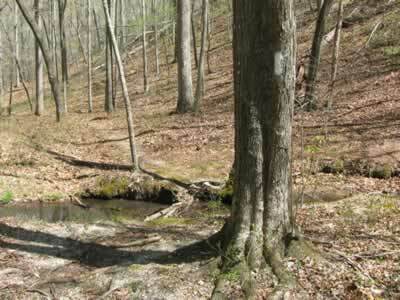 The trail goes ahead and crosses the creek on the branches and a blazed tree appears in just a short while. 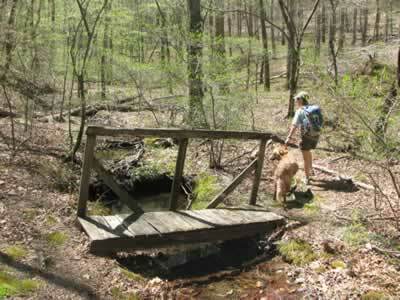 After crossing the creek the trail follows the main branch of the stream for a short while and then crosses it on an old bridge. The trail then makes a U-turn and follows the creek back down stream. It passes the crossing and even where the trail came down from the ridge. 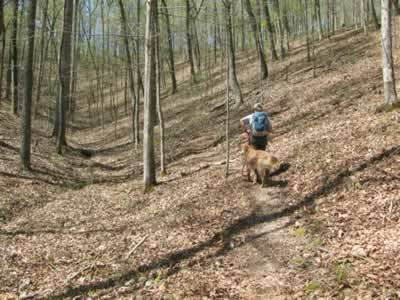 Then the trail turns and climbs out of the hollow to the west. 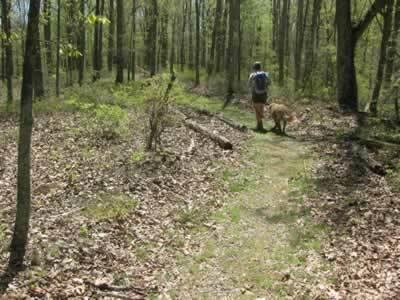 The trail follows the old road and ridge for 1.10 miles back to the signed Loop Trail junction. At the junction turn right and return to the trailhead .50 miles ahead. 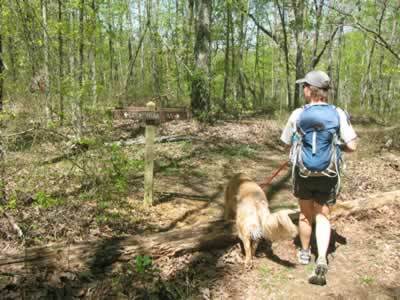 The total length of the trail is 3.2 miles.